West Sacramento, CA – The Sacramento River Cats (5-11) dropped game one of their four-game series to the Las Vegas 51s (9-8) by a score of 3-2 in front of a packed Raley Field crowd Saturday night. Leadoff hitter Drew Stubbs got things going early for Sacramento, hitting a solo home run in his very first at bat of the ballgame for the River Cats. Las Vegas countered by scoring in their half of the second and third innings against River Cats starter Michael Roth, giving the visitors a 2-1 lead. Roth gave up two runs (one earned) on eight hits while striking out two and walking one over 4.2 innings on the hill tonight. Sacramento’s only other RBI came courtesy of third baseman Ryder Jones, who drove in shortstop Christian Arroyo in the sixth, tying the game at two. Salt Lake then scored what proved to be the game-winner in the eighth off reliever Chase Johnson. Game two will feature River Cats right-hander Dan Slania (0-2, 7.45) up against 51s right-hander Rafael Montero (0-0, 0.00). First pitch is set for 1:05 pm (PT) and the game can be heard live online at rivercats.com and on the air on ESPN 1320. 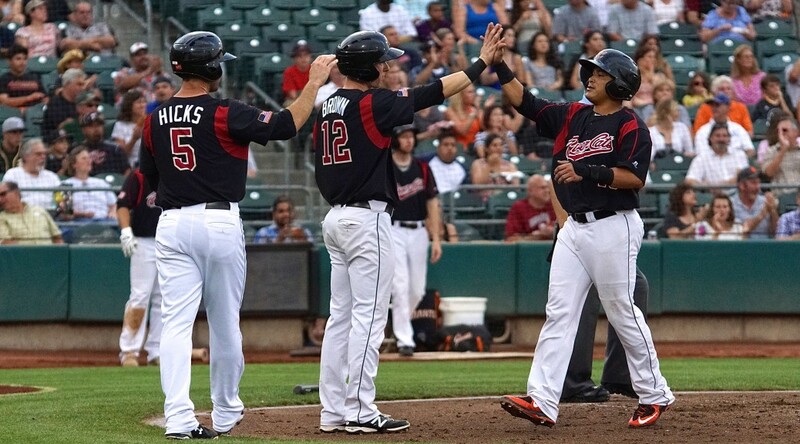 West Sacramento, CA – The Sacramento River Cats (1-0) started off the 2017 season with a bang, coming from behind to defeat the Tacoma Rainiers (0-1) by a score of 6-5 Saturday night at Raley Field. Both offenses came ready to play, scoring a combined eight runs in the first two innings. Sacramento starter Clayton Blackburn yielded two runs in the first frame but the River Cats offense answered back three runs of their own. Christian Arroyo doubled in the inning and Austin Slater highlighted the frame with a two-run double to make it a 3-2 game. The scoring spree continued into the second inning when Blackburn gave up a three-run homer to Tacoma right fielder Tyler O’Neill. Blackburn lasted just three innings, allowing five runs on six hits with a strikeout before the bullpen took over and shutdown the Rainiers the rest of the way. The two ‘pens traded zeros until the eighth inning when the River Cats offense roared back to life. Slater drove in another with an RBI-single and an error on Tacoma’s O’Neill allowed the tying run to also come home. Later in the frame, right fielder Orlando Calixte played hero by driving in Slater to give the River Cats the lead. The River Cats will send right-hander Tyler Beede (0-0, 0.00) to the mound for Sunday’s matinee. Beede, the No. 1 prospect in the Giants’ organization, will be making his Triple-A debut and will square off against Rainiers’ right-hander Dylan Unsworth. First pitch is set for 1:05 p.m. (PT) and the game can be heard live online at rivercats.com. West Sacramento, CA – The Sacramento River Cats are excited to announce their 2017 Opening Day roster. Included on the roster are a number of returners from the 2016 squad plus a whole crop of prospects rising through the system. Among those on the roster are eight of the San Francisco organization’s Top 30 prospects, including the top two prospects in the system. Tyler Beede and Christian Arroyo, the number one and two Giants prospects respectively, are joined by Joan Gregorio (#8), Steven Okert (#12), Austin Slater (#19), Chris Stratton (#23), Chase Johnson (#25), and Ryder Jones (#30). Last year, the Opening Day roster included seven of the organization’s Top 30 prospects. Eight different players on the roster will be making their Triple-A debut, including Jae-Gyun Hwang, a Korean Baseball Organization All-Star. Hwang signed with the Giants this offseason and put together a very strong Spring Training, hitting .340 with five home runs and 15 RBI. Leading this talented roster will be new River Cats manager Dave Brundage. Brundage joined the organization this offseason, bringing with him two decades of managerial experience. He is coming off an excellent 2016 season in which he led the Lehigh Valley Iron Pigs to an 85-58 record, the second best mark in Triple-A. Joining him are returning hitting coach Damon Minor and pitching coach Dwight Bernard. Also returning are athletic trainer LJ Petra and strength & conditioning coach Adam Vish. The River Cats open the 2017 season this Thursday, April 6 at home against the visiting Tacoma Rainiers (Seattle Mariners). First pitch is set for 7:05 pm with 6:05 pm gates. Tickets for Opening Night and the rest of the first homestand are still available. Tickets can be purchased online at rivercats.com, over the phone at (916) 376-HITS, or by visiting the Round Table Pizza Box Office at Raley Field.